2moms2dogs2babies: Rest In Peace, Nana. 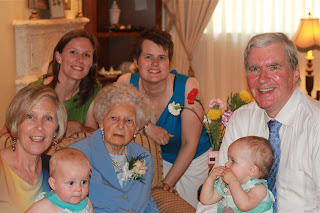 My grandmother passed away yesterday afternoon at the age of 100. 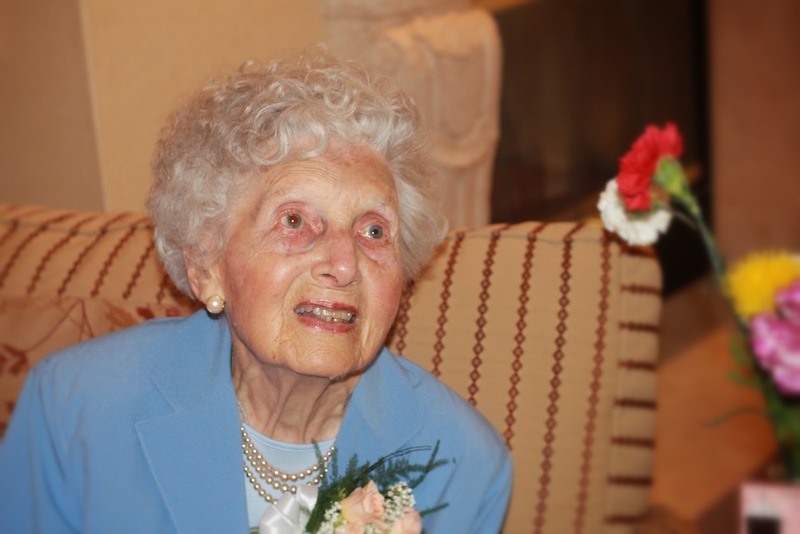 At the age of 100, you can imagine that Nana had a few aches and pains. She never, ever complained. For the last few months, she had to spend the majority of her time attached to an oxygen tank. But, whenever I would walk in there with the girls in tow, a smile would always cross her face. How are you, Nana? I would ask. Oh I'm pretty good! She would often answer in as chipper a voice as she could muster up. Nana never understood the concept of voicemail. Since the girls were born, she would call me quite frequently to check in. The "girls" (aka. the nurses and support workers at the her assisted living home) were always asking about when the twins were coming for a visit. If we weren't home, she would sometimes leave a message. The message typically only contained two words, Nana. Called. We would often get a good chuckle from her messages! When the girls were only a few months old, I remember popping in for a surprise visit while Nana was in the dining room eating lunch. She was sitting at a table with two of her friends. The room was full. As you can imagine, when I walked into an assisted living home with infant twins, heads turned and residents came rushing up to me as fast as their walkers could take them. With a smile on her face, she proudly introduced us to her friends. As a child, I remember my grandparents going on long walks on the beach when we were down at their condo in Florida or up at our family's cottage in Muskoka. Even into her 90s, Nana kept walking. At the cottage, she would walk the deck for her exercise. She would always smile and wave at us through the large windows. She adored sitting in the sun. I remember one of the nurses telling me over the summer that Nana had sat outside for over two hours basking in the sun! I'm so grateful that the girls got to meet their great-grandmother. I saw her for the last time on Monday. She was very weak and tired. She wasn't able to say or do very much. As we were leaving, Teagan and Quinn waved to Nana and blew her a kiss. She managed to lift her hand up and give them a wave. Rest in peace, Nana. You will be missed. 100 years old. THAT is something to celebrate. Wow, what a life she lived. She sounds like such a wonderful and beautiful grandma. I'm sorry that you lost her, but I'm so happy you were able to share so many years with her. side note, the three generations in that picture is quite amazing to see. You, your mom and grandma all look very much the same in a lot of ways. It really is something to celebrate! 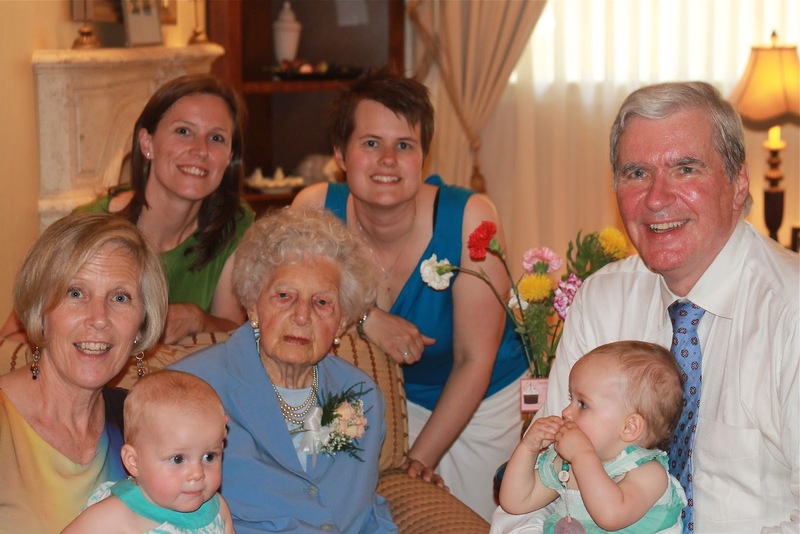 It was incredible to celebrate her 100th birthday and our friend's daughter's 1st birthday on the same day. The circle of life! I'm so sorry for your loss. Grandmothers are such special people, and even more so when they become great-grandmothers to your children. My grandmother passed away when Erik was 11 months old, and I, too, was so glad she got to know him. She adored him. I wish she could have met Ian, but the memories of her with Erik bring me happiness still. Erik and I used to go visit my grandma in the nursing home all the time, and the residents there were all over him too! I remember it taking us forever to get to my grandma's room. I will miss our visits for sure. Not only did it make my grandmother happy, it also made the other residents and staff happy to see the girls. It was so sweet. So sorry to hear about your Nana, Ashleigh. I can imagine how sad you must be to lose her, though it is wonderful that she lived so long and got to meet your girls. I'm sure she LOVED that. I am very grateful that she got to meet the girls. 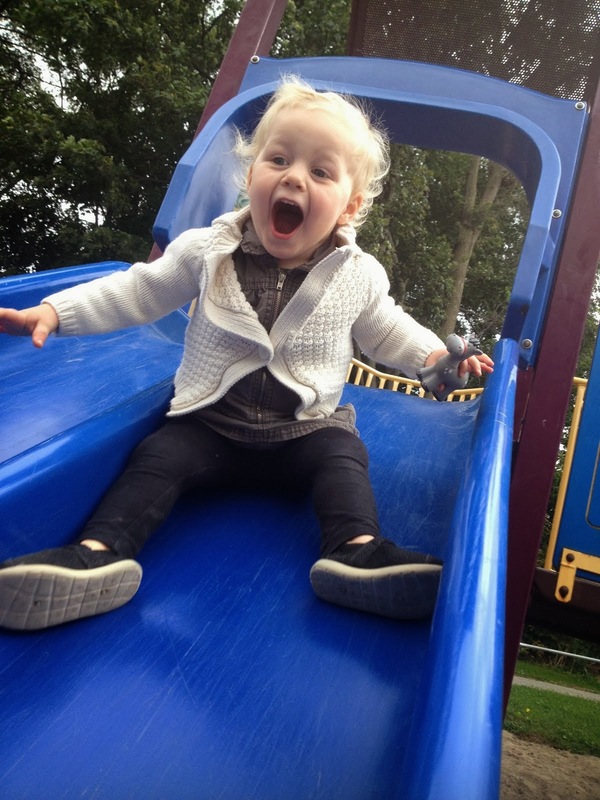 She was always so happy to see us, even on the shortest of visits (usually because of fussiness or tears! ).